Mindfulness has without doubt been the fastest spreading and most popular concept in psychotherapy in the last two decades. Its influence exceeds that of any other individual concept or approach in modern psychotherapy. However, there are many dilemmas, open questions and controversies related to this rapid, almost fanatic spread, which obviously compensates for a certain lack in modern Euro- and Americo-centric societies. Similarly, we are witnessing in the West a lack of reflection, a process of limitless idealization, and the search for a panacea. This all flows with a tint of colonialism, presumptuously taking over ideas, concepts and techniques without a proper study of the primary sources, and with all the accompanying negative side-effects: profiteering, self-promotion, unethical conduct, empty promises of instant rewards, and so on. In the present paper, the development of interest in mindfulness in psychotherapy, as well as the research findings and dilemmas, and concepts and mechanisms of applying mindfulness in psychotherapy, will be reviewed. The main purpose of the paper is to contribute to the critical reflection in studying and applying mindfulness in psychotherapy. Abbott, Rebecca A., et al. 2014. “Effectiveness of Mindfulness-based Stress Reduction and Mindfulness Based Cognitive Therapy in Vascular Disease: A Systematic Review and Meta-analysis of Randomised Controlled Trials.” Journal of Psychosomatic Research 76: 341–51. Baer, Ruth A. 2011. “Measuring Mindfulness.” Contemporary Buddhism: An Interdisciplinary Journal 12: 241–61. Beck, Judith S. 2011. Cognitive Behavior Therapy. Basics and Beyond. New York: The Guilford Press. Beitel, Mark, et al. 2014. “Stillness and Motion: An Empirical Investigation of Mindfulness and Self-actualization.” Person-Centered & Experiential Psychotherapies 13: 187–202. Bishop, Scorr R., et al. 2004. “Mindfulness: A Proposed Operational Definition.” Clinical Psychology: Science and Practice 11: 230–41. Bowen, Sarah, et al. 2014. “Relative Efficacy of Mindfulness-based Relapse Prevention, Standard Relapse Prevention, and Treatment as Usual for Substance Use Disorders: a Randomized clinical Trial.” JAMA Psychiatry 71 (5): 547–56. Braehler, Christine, et al. 2012. “Exploring Change Processes in Compassion Focused Therapy in Psychosis: Results of a Feasibility Randomized Controlled Trial.” British Journal of Clinical Psychology 52: 199–214. Brotto, Lori, Rosemary Basson, and Mijal Luria. 2008. “A Mindfulness-based Group Psychoeducational Intervention Targeting Sexual Arousal Disorder in Women.” Journal of Sexual Medicine 5: 1646–59. Chadwick, Paul, Katherine N. Taylor, and Nicola Abba. 2005. “Mindfulness Groups for People with Psychosis.” Behavioural and Cognitive Psychotherapy 33: 351–9. Chiesa, Alberto, and Alessandro Serretti. 2014. “Are Mindfulness-Based Interventions Effective for Substance Use Disorders? A Systematic Review of the Evidence.” Substance Use & Misuse 49: 492–512. Chen, Kevin, et al. 2012. “Meditative Therapies for Reducing Anxiety: A Systematic Review and Meta-analysis of Randomized Controlled Trials.” Depression and Anxiety 29 (7): 545–62. Ditrich, Tamara. 2013. “Mindfulness in Modern Buddhism: New Approaches and Meanings.” In One Dharma: Many Buddhist Traditions: A Festschrift in Memory of K Sri Dhammananda (1919–2006), edited by B. Liow Woon Khin, 181–90. Petaling Jaya: Buddhist Gem Fellowship. –––. 2016. 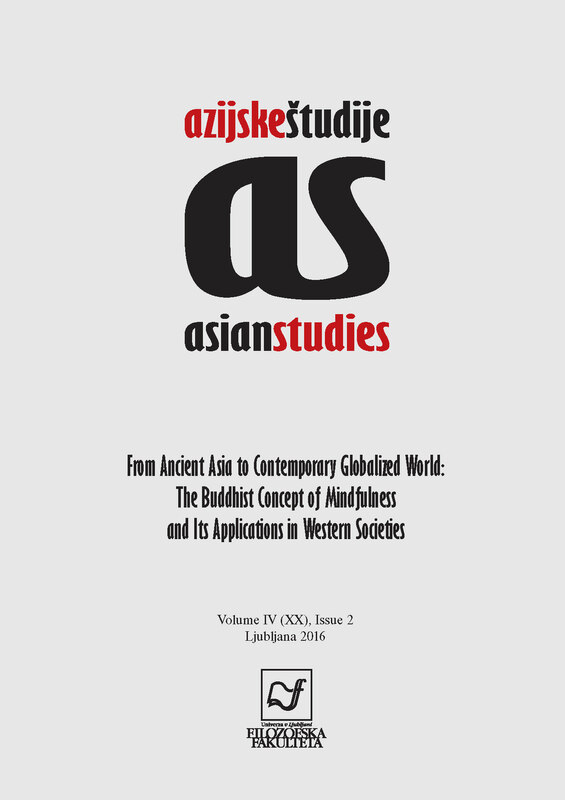 “Buddhism between Asia and Europe: The Concept of Mindfulness through an Historical Lens.” Asian Studies 4 (1): 197–213. Fennell, Melanie, and Zindel Segal. 2011. “Mindfulness-based Cognitive Therapy: Culture Clash or Creative Fusion.” Contemporary Buddhism 12: 125–42. Fonagy, Peter, and Mary Target. 2003. Psychoanalytic Theories. Perspectives from Developmental Psychopathology. London: Whurr. Fjorback, Lone O., et al. 2012. “Mindfulness Therapy for Somatization Disorder and Functional Somatic Syndromes – Randomized Trial with One-Year Follow-up.” Journal of Psychosomatic Research 74 (1): 31–40. Gallagher, Shaun, and Dan Zahavi. 2008. The Phenomenological Mind. An Introduction to Philosophy of Mind and Phenomenology. London: Routledge. Germer, Christopher K., Ronald D. Siegel, and Paul R. Fulton, eds. 2013. Mindfulness and Psychotherapy. New York: The Guilford Press. Grossman, Paul, et al. 2004. “Mindfulness-based Stress Reduction and Health Benefits. A Meta-analysis.” Journal of Psychosomatic Research 57: 35–43. Grossman, Paul, et al. 2007. “Mindfulness Training as an Intervention for Fibromyalgia: Evidence of Postintervention and 3-Year Follow-up Benefits in Well-Being.” Psychotherapy and Psychosomatics 76 (4): 226–33. Gumley, Andrew, et al. 2010. “A Compassion Focused Model of Recovery after Psychosis.” International Journal of Cognitive Therapy 3 (2): 186–201. Hayes, Steven C. 2004. “Acceptance and Commitment Therapy, Relational Frame Theory, and the Third Wave of Behavioral and Cognitive Therapies.” Behavior Therapy 35: 639–65. Heffner, Michelle, et al. 2002. “Acceptance and Commitment Therapy in the Treatment of an Adolescent Female with Anorexia Nervosa: A Case Example.” Cognitive and Behavioral Practice 9: 232–6. Hill, Christina L.M., and John A. Updegraff. 2012. “Mindfulness and Its Relationship to Emotion Regulation.” Emotion 12 (1): 81–90. Hofmann, Stefan G., et al. 2010. “The Effect of Mindfulness-Based Therapy on Anxiety and Depression: A Meta-Analytic Review.” Journal of Consulting and Clinical Psychology 78 (2): 169–83. Hoffman, Caroline J., et al. 2012. “Effectiveness of Mindfulness-Based Stress Reduction in Mood, Breast- and Endocrine-Related Quality of Life, and Well-Being in Stage 0 to III Breast Cancer: A Randomized, Controlled Trial.” Journal of Clinical Oncology 30: 1–8. Hölzel, Britta K., et al. 2011. “How Does Mindfulness Meditation Work? Proposing Mechanisms of Action from a Conceptual and Neural Perspective.” Perspectives on Psychological Science 6 (6): 537–59. Ives-Deliperi, Victoria L., Mark Solms, and Ernesta M. Meintjes. 2011. “The Neural Substrates of Mindfulness: An fMRI Investigation.” Social Neuroscience 6(3): 231–42. Jha, Amishi, et al. 2010. “Examining the Protective Effects of Mindfulness Training on Working Memory Capacity and Affective Experience.” Emotion 10 (1): 54–64. –––. 2013. Full Catastrophe Living. How to Cope with Stress, Pain and Illness Using Mindfulness Meditation. London: Piatkus. Kabat-Zinn, Jon, Leslie Lipworth, and Robert Burney. 1985. “The Clinical Use of Mindfulness Meditation for The Self-Regulation of Chronic Pain.” Journal of Behavioral Medicine 8 (2): 163–90. Khoury, Bassam, et al. 2013. “Mindfulness-based Therapy: A Comprehensive Meta-analysis.” Clinical Psychology Review 33: 763–71. Kold, Mette, et al. 2012. “Mindfulness-based Psychological Intervention for Coping with Pain in Endometriosis.” Nordic Psychology 64 (1): 2–16. Kristeller, Jean L., and Ruth Q. Wolever. 2011. “Mindfulness-based Eating Awareness Training for Treating Binge Eating Disorder: The Conceptual Foundation.” Eating Disorders 19 (1): 49–61. Langer, Alvaro, and Adolfo Cangas. 2012. “Applying Mindfulness Therapy in a Group of Psychotic Individuals: A Controlled Study.” Behavioural and Cognitive Psychotherapy 40: 105–9. Labelle, Laura E., et al. 2015. “Mediators of Mindfulness-Based Stress Reduction (MBSR): Assessing the Timing and Sequence of Change in Cancer Patients.” Journal of Clinical Psychology 71 (1): 21–40. Lenoir, Frédéric. 1999. La rencontre du bouddhisme et de l’Occident. Paris: Fayard. Ma, Helen, and John Teasdale. 2004. “Mindfulness-based Cognitive Therapy for Depression: Replication and Exploration of Differential Relapse Prevention Effects.” Journal of Consulting and Clinical Psychology 72 (1): 31–40. Marlatt, Alan, and Nitesh Chawla. 2007. “Meditation and Alcohol Use.” Southern Medical Journal 100 (4): 451–3. Mateos Rodríguez, Irene, Felicity A. Cowdrey, and Rebecca J. Park. 2014. “Is There a Place for Mindfulness in the Treatment of Anorexia Nervosa?” Advances in Eating Disorders: Theory, Research and Practice 2 (1): 42–52. Milčinski, Lev. 1990. O mističnem ali meditativnem doživetju. Primorska srečanja 15 (108–109): 383–8. Neff, Kristin D., Kristin L. Kirkpatrick, and Stephanie S. Rude. 2007. “Self-compassion and Its Link to Adaptive Psychological Functioning.” Journal of Resesarch in Personality 41: 139–54. Pečenko, Primož. 1990. Pot pozornosti. Osnove budistične meditacije. Ljubljana: Domus. Piet, Jacob, et al. 2010. “A Randomized Pilot Study of Mindfulness-based Cognitive Therapy and Group Cognitive-behavioral Therapy for Young Adults with Social Phobia.” Scandinavian Journal of Psychology 51 (5): 403–10. Roemer, Lizabeth, Susan Orsillo, and Kristalyn Salters-Pedneault. 2008. “Efficacy of an Acceptance-based Behavior Therapy for Generalized Anxiety Disorder: Evaluation in a Randomized Controlled Trial.” Journal of Consulting and Clinical Psychology 76 (6): 1083–9. Safran, Jeremy D., ed. 2003. Psychoanalysis and Buddhism. An Unfolding Dialogue. Boston: Wisdom Publications. Salzberg, Sharon. 2011. Real Happiness: The Power of Meditation. New York: Workman. Schmidt, Stefan, et al. 2011. “Treating Fibromyalgia with Mindfulness-Based Stress Reduction: Results from a 3-armed Randomized Controlled Trial.” PAIN 152: 361–9. Segal, Zindel V., J. Mark G. Williams, and John D. Teasdale. 2002. Mindfulness-based Cognitive Therapy for Depression: A New Approach to Preventing Relapse. New York: Guilford Press. Shapiro, SL, et al. 2006. “Mechanisms of Mindfulness.” Journal of Clinical Psychology 62 (3): 373–86. Shonin, Edo, et al. 2014. “Do Mindfulness Based Therapies Have a Role in the Treatment of Psychosis?” Australia and New Zealand Journal of Psychiatry 48 (2): 124–7. Silverstein, Gina, et al. 2011. “Effects of Mindfulness Training on Body Awareness to Sexual Stimuli: Implications for Female Sexual Dysfunction.” Psychosomatic Medicine 73 (9): 817–25. Speca, Michael, et al. 2000. “A Randomized Wait-List Controlled Trial: The Effects of a Mindfulness Meditation Based Stress Reduction Program on Mood and Symptoms of Stress in Cancer Outpatients.” Psychosomatic Medicine 62: 613–22. Tapper, Katy, et al. 2009. “Exploratory Randomised Controlled Trial of a Mindfulness-Based Weight Loss Intervention for Women.” Appetite 52 (2): 396–404. Teasdale, John D., et al. 2000. “Prevention of Relapse/Recurrence in Major Depression by Mindfulness Based Cognitive Therapy.” Journal of Consulting and Clinical Psychology 68: 615–23. Teasdale, John D., et al 2002. “Metacognitive Awareness and Prevention of Relapse in Depression: Empirical Evidence.” Journal of Consulting and Clinical Psychology 70: 275–87. Telch, Christy F., William S. Agras, and Marsha M. Linehan. 2001. “Dialectical Behavior Therapy for Binge Eating Disorder.” Journal of Consulting & Clinical Psychology 69 (6): 1061–5. Varela, Francisco J., and Jonathan Shear. 1999. “First-person Methodologies: What, Why, How?” Journal of Consciousness Studies 6: 1–14. Vøllestad, Jon, Morten Nielsen, and Geir Nielsen. 2012. “Mindfulness- and Acceptance-based Interventions for Anxiety Disorders: A Systematic Review and Meta-Analysis.” British Journal of Clinical Psychology 51 (3): 239–60. Witkiewitz, Katie, and Sarah Bowen. 2010. “Depression, Craving, and Substance Use Following a Randomized Trial of Mindfulness-based Relapse Prevention.” Journal of Consulting & Clinical Psychology 78 (3): 362–74. Yalom, I.D. 1980. Existential Psychotherapy. New York: Basic Books.